For Wikipedia's information page on Wikidata, see Wikipedia:Wikidata. Wikidata is a collaboratively edited knowledge base hosted by the Wikimedia Foundation. It is a common source of open data that Wikimedia projects such as Wikipedia can use, and anyone else, under a public domain license. This is similar to the way Wikimedia Commons provides storage for media files and access to those files for all Wikimedia projects, and which are also freely available for reuse. Wikidata is powered by the software Wikibase. Wikidata is a document-oriented database, focused on items, which represent topics, concepts, or objects. Examples of items include 1988 Summer Olympics (Q8470), love (Q316), Elvis Presley (Q303), and Gorilla (Q36611). Each item is identified by a unique number, prefixed with the letter Q, known as a "QID". This enables the basic information required to identify the topic the item covers to be translated without favouring any language. Item labels need not be unique. For example, there are two items named "Elvis Presley": Elvis Presley (Q303) represents the American singer and actor, and Elvis Presley (Q610926) represents his self-titled album. Fundamentally, an item consists of a label, a description, and some number of statements. Statements are how any information known about an item is recorded in Wikidata. Formally, they consist of key-value pairs, which match a property (such as "author", or "publication date") with one or more values (such as "Sir Arthur Conan Doyle" or "1902"). For example, the informal English statement "milk is white" would be encoded by a statement pairing the property color (P462) with the value white (Q23444) under the item milk (Q8495). Statements may map a property to more than one value. For example, the "occupation" property for Marie Curie could be linked with the values "physicist" and "chemist", to reflect the fact that she engaged in both occupations. Values may take on many types including other Wikidata items, strings, numbers, or media files. Properties prescribe what types of values they may be paired with. For example, the property official website (P856) may only be paired with values of type "URL". Properties may also define more complex rules about their intended usage, termed constraints. For example, the capital (P36) property includes a "single value constraint", reflecting the reality that (typically) territories have only one capital city. Constraints are treated as hints rather than inviolable rules. Optionally, qualifiers can be used to refine the meaning of a statement by providing additional information that applies to the scope of the statement. For example, the property "population" could be modified with a qualifier such as "as of 2011". Statements may also be annotated with references, pointing to a source backing up the statement's content. In linguistics, a lexeme is a unit of lexical meaning. Similarly, Wikidata's lexemes are items with a structure that makes them more suitable to store lexicographical data. Besides of storing the language to which the lexeme refers, they have a section for forms and a section for senses. Wikidata was launched on 29 October 2012 and was the first new project of the Wikimedia Foundation since 2006. At this time, only the centralization of language links was available. This enabled items to be created and filled with basic information: a label – a name or title, aliases – alternative terms for the label, a description, and links to articles about the topic in all the various language editions of Wikipedia. Historically, a Wikipedia article would include a list of interlanguage links, being links to articles on the same topic in other editions of Wikipedia, if they existed. Initially, Wikidata was a self-contained repository of interlanguage links. Wikipedia language editions were still not able to access Wikidata, so they needed to continue to maintain their own lists of interlanguage links. On 14 January 2013, the Hungarian Wikipedia became the first to enable the provision of interlanguage links via Wikidata. This functionality was extended to the Hebrew and Italian Wikipedias on 30 January, to the English Wikipedia on 13 February and to all other Wikipedias on 6 March. After no consensus was reached over a proposal to restrict the removal of language links from the English Wikipedia, the power to delete them from the English Wikipedia was granted to automatic editors (bots). On 23 September 2013, interlanguage links went live on Wikimedia Commons. On 4 February 2013 statements were introduced to Wikidata entries. The possible values for properties were initially limited to two data types (items and images on Wikimedia Commons), with more data types (such as coordinates and dates) to follow later. The first new type, string, was deployed on 6 March. On 7 September 2015, the Wikimedia Foundation announced the release of the Wikidata Query Service, which lets users run queries on the data contained in Wikidata. The service uses SPARQL as the query language. As of November 2018, there are at least 26 different tools that allow to query the data in different ways. In November 2014, Wikidata received the Open Data Publisher Award from the Open Data Institute “for sheer scale, and built-in openness”. As of November 2018, Wikidata information is used in 58.4% of all English Wikipedia articles, mostly for external identifiers or coordinate locations. In aggregate, data from Wikidata is shown in 64% of all Wikipedias' pages, 93% of all Wikivoyage articles, 34% of all Wikiquotes', 32% of all Wikisources', and 27% of Wikimedia Commons'. Usage in other Wikimedia Foundation projects is testimonial. As of November 2018, Wikidata's data is visualized by at least 20 other external tools and at least 100 papers have been published about Wikidata. Its importance has been recognized by numerous cultural institutions. ^ From Freebase to Wikidata: The Great Migration; quote: Another example is Wikidata, a collaborative knowledgebase developed by Wikimedia Deutschland since 2012 and operated by the Wikimedia Foundation..
^ "Wikidata.org Traffic, Demographics and Competitors - Alexa". www.alexa.com. Retrieved 4 February 2019. ^ "Data Revolution for Wikipedia". Wikimedia Deutschland. March 30, 2012. Archived from the original on September 11, 2012. Retrieved September 11, 2012. ^ "Wikidata - Lexicographical data documentation". ^ Dickinson, Boonsri (March 30, 2012). "Paul Allen Invests In A Massive Project To Make Wikipedia Better". Business Insider. Retrieved September 11, 2012. ^ Perez, Sarah (March 30, 2012). "Wikipedia's Next Big Thing: Wikidata, A Machine-Readable, User-Editable Database Funded By Google, Paul Allen And Others". TechCrunch. Archived from the original on September 11, 2012. Retrieved September 11, 2012. ^ Pintscher, Lydia (October 30, 2012). "wikidata.org is live (with some caveats)". wikidata-l (Mailing list). Retrieved November 3, 2012. ^ Roth, Matthew (March 30, 2012). "The Wikipedia data revolution". Wikimedia Foundation. Archived from the original on September 11, 2012. Retrieved September 11, 2012. ^ Pintscher, Lydia (14 January 2013). "First steps of Wikidata in the Hungarian Wikipedia". Wikimedia Deutschland. Retrieved 17 December 2015. ^ Pintscher, Lydia. "Wikidata coming to the next two Wikipedias". Wikimedia Deutschland. Retrieved January 31, 2013. ^ Pintscher, Lydia (13 February 2013). 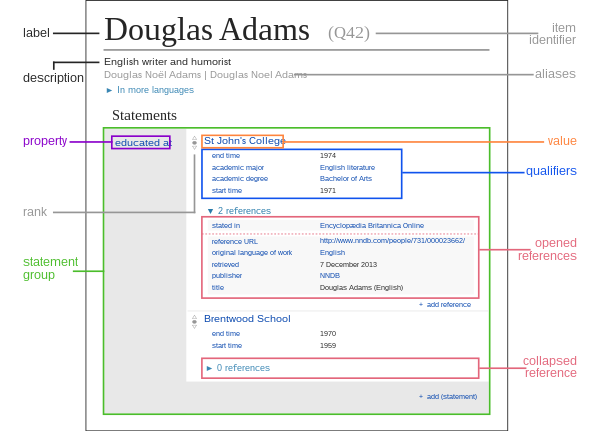 "Wikidata live on the English Wikipedia". Wikimedia Deutschland. Retrieved 15 February 2013. ^ Pintscher, Lydia (6 March 2013). "Wikidata now live on all Wikipedias". Wikimedia Deutschland. Retrieved 8 March 2013. ^ "Wikidata ist für alle Wikipedien da" (in German). Golem.de. Retrieved 29 January 2014. ^ "Wikipedia talk:Wikidata interwiki RFC". March 29, 2013. Retrieved March 30, 2013. ^ Pintscher, Lydia (23 September 2013). "Wikidata is Here!". Commons:Village pump. ^ Pintscher, Lydia. "Wikidata/Status updates/2013 03 01". Wikimedia Meta-Wiki. Wikimedia Foundation. Retrieved 3 March 2013. ^ Pintscher, Lydia (27 March 2013). "You can have all the data!". Wikimedia Deutschland. Retrieved 28 March 2013. ^ "Wikidata goes live worldwide". The H. 2013-04-25. Archived from the original on 3 January 2014. ^ Lydia, Pintscher (16 September 2015). "Wikidata: Access to data from arbitrary items is here". Wikipedia:Village pump (technical). Retrieved 30 August 2016. ^ Lydia, Pintscher (27 April 2016). "Wikidata support: arbitrary access is here". Commons:Village pump. Retrieved 30 August 2016. ^ "Announcing the release of the Wikidata Query Service". ^ "Wikidata Query Data tools". ^ "First ODI Open Data Awards presented by Sirs Tim Berners-Lee and Nigel Shadbolt". Archived from the original on 2016-03-24. ^ "Percentage of articles making use of data from Wikidata". ^ "Wikidata Tools - Visualize data". ^ "International Semantic Web Conference 2018". ^ commons:File talk:Wikidata-logo-en.svg#Hybrid. Retrieved 2016-10-06.